Tucson, AZ – July 3, 2017 — Wheatmark, Inc. is pleased to announce the release of Restoring Character in America by Michael J. Kerrigan. This is the author’s third book about current events in America. What defines “good character” to the average American? Is it what one does when no one is looking? Is it moral certitude about one’s actions? Is it courage? Is it compassion? Can it be taught? 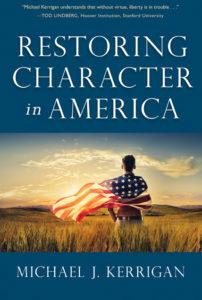 Restoring Character in America identifies the decline in character in our country, but then gives the reader hope for the future by showcasing leaders whose careers are successfully turning around this trend in our schools, communities, businesses, and the military. Michael J. Kerrigan, a self-described recovering lobbyist, after spending thirty-five years in the political arena, has turned his advocacy skills to improving character education in our nation as founder of the Character Building Project. Restoring Character in America, ISBN 9781627875257, was released by Wheatmark, Inc. on June 29, 2017. The book has 112 pages and is being sold as a trade paperback for $9.95 and as an ebook for $4.99. By Wheatmark Team|2018-03-29T11:09:19-07:00July 3, 2017|News|Comments Off on What Defines Good Character?